Welcome to Ward 5 Online: This Just In... Roche Bros In Davis Square? This Just In... Roche Bros In Davis Square? Could the wait for a ground-level occupant of the Social Security Building in Davis Square be over? It is a possibility, according to Alderman At Large Jack Connolly's Facebook page (and Twitter). The Vice-President of the Board of Aldermen broke the news that the market chain was interested and will hold a tentative meeting on-site (240 Elm Street), Wednesday September 10th at 6:00 PM. And parking would be where? Any sighting of the Ward 6 Alderman? I don't believe McKinnons will be too happy if Roche comes into Davis Square. Don't think McKinnons can compete variety wise and price wise with Roche's buying power with suppliers; resulting in lower retail prices. Some who may think differently will cite McKinnon's great meat selections and prices. But for one here that had experience with Roche's offerings and prices, McKinnon's will be "outgunned" in losing customers to Roche. Parking will be an issue unless they've done market testing that shows enough walk-in traffic. Ward 6 Alderman? Did someone check Brookline? park; with many of the customers as local foot traffic. affixed to their windshield can park in municipal parking lots on Saturdays free of charge, without getting a ticket. I don't think Roche can match McKinnon's price point & McKinnon's can't match Roche selection. Thinking they may be able to coexist...at least I want them to. I hope this happens and I hope Rebekah doesn't ruin it like she ruined the beer works deal. I'd love to have this! It suits the needs of Davis Square residents much better than the previous World of Beer and Beer Works proposals. No parking is needed, since it's a block from the T station and has a bus stop right in front. Years ago there was a Publix Supermarket (yes, spelled with an "x")---in the middle of the square, same side as The Burren. Was successful until the Star Market opened up at Porter Square with a large parking lot. There also was an A&P Supermarket at the east end of the square across from the Winter Hill Bank. A close inspection of the illustration shows that Roche is actually proposing a "Brothers Marketplace", which is a new sub-brand of smaller grocery stores. They opened the first one in Weston a few months ago. Who here are "complaining?" Not the case at all. Appears what we have is a civil exchange of thoughts by all posters contributing to the subject. "Brothers" concept is far different as supermarkets go, in size, pricing, and offerings. Current "Brothers" other locations average 10,000 sq. feet; which would probably be the space available in Davis; give or take some square footage. At 10,000 sq,feet an upgrade in size from an average convenience store such as 7/11 etc. Now as to their target customers. Given their offerings, merchandising, and pricing, in their other locations its fairly apparent they will be after the somewhat more affluent Somerville/Cambridge etc. customers. Possibly those customers never been inside McKinnons. Given where they have allready set up "Brothers" stores in towns known to be more affluent communities, the above would apply. The Roches are not stupid; they know how Somerville has changed and is continuing to change; and Davis Square has been attracting spending "customers" from other cities and towns for some years now. Rebekah didn't ruin anything on the Beer works project. She helped stop Davis Sq. turning into a booze town. ....and allow me to add; bringing new people into Davis Square, as "Brothers" customers from other cities and towns, will depend mainly upon their advertising reach. Roche's Supers, including their smaller store divisions,in order to maintain a needed gross profit margin to cover their fixed and variable expenses, and recover a fair net profit, their higher everyday retail price points will reflect their higher unit cost. Yes, to attract and keep customers they, as corporate chains do, will probably be offering what's called "loss leaders." In many instances the advertised item is not sold at a "loss" beause they are subsidized by payments made, on a contract basis, from the manufacturer. Contract offerings being made by food broker reps and/or direct company salespeople. If you look at the other communities where Roches are, you get a picture of how the suburbinization of Somerville is in full steam. For better or for worse. A generation ago, it was the 'city' moving out to Somerville. Now, it's the 'burbs moving in. Add to this the new Outback Steakhouse on it's way into town. Where is "Outback" going to be in Somerville? Use to frequent an "Outback" at Wellington Shopping Center, Medford; and then one day they were gone forever. Don't know why! Thought they did a nice business at that location. liked their menu, service and prices very much. 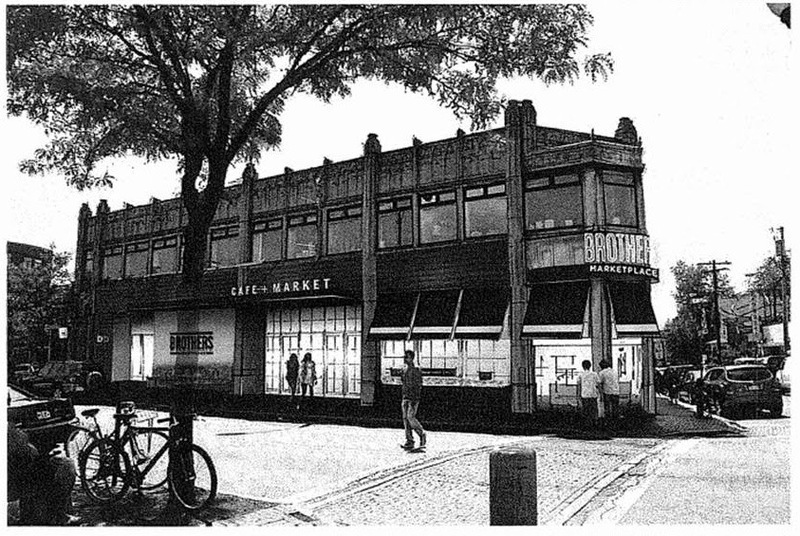 Roche is also building a full-sized supermarket at the old Filene's Basement location in Boston. That's about as urban as you can get. Where's this new steakhouse going to be? DeMoulas did just that when they had 13 stores. That's when George and older brother Telemachas (spelling?) was alive. Both probably rolling over in their graves given what is going on between their families. Johnnies Foodmasters went "south"-couldn't compete absent their own warehouse. Ward 5: How about opening up a discussion, people's thoughts, about the DeMoulas/Market Basket situation? That's an interesting suggestion. Do you think I'm too late to the game to open up the discussion? There are other places where discussion has been ongoing. Point well taken, Ward 5. But "other places" don't interest me. My, and maybe others, interest is here. Whatever you decide---no problem either way you decide! In my opinion, even if the workers go back to work tomorrow; there will be ramifications for months to come. These "battling" cousins have had issues going back 15 or more years.